Sometimes, you just can't deal with all your frizzy split ends, and you're left with no choice but to tie your hair up in a bun. Those splurges on rebonding sessions or coloring your hair eventually haunt you, and you just want to hide the evidence of your hair crimes. On the flip side, though, there are also those #Blessed times when your locks look so lovely, and you enjoy a so-called, "Lugay Effect" where you just let your hair down and let it do the talking. Simply put, your hair gives you confidence, gets heads turning, and throws a lot of good vibes your way. Ever had these major #LugayEffect moments? You couldn't help but take a selfie, huh? Show off those naturally gorgeous tresses, girl! No time to go home and fix your hair before that date? No problem! Letting your hair down does the trick. She absolutely adores your hair so much that she never asked when you're going to have a boyfriend! FINALLY. All she ever wondered was how you managed your split ends, and, tbh, that was waaaay easier to answer. Your hair looks great, and you didn't have to spend so much to get the look. The secret is one handy bottle that makes your hair look ~*amazing*~—from the roots to the ends. SCORE! Bangs? Check. Shiny, low-maintenance locks with less split ends? Check. Cute poses? Triple check! Now, where's that oppa you're just dying to meet? And you can't help but twirl your locks because of the unbearable kilig. Are you finally going to play that rom-com heroine? Should you make the first move or is he going to ask you out soon? SO EXCITING OMG! You react modestly, but internally, you're squealing with delight. FINALLY! That woman you look up to paid you a compliment—not an ordinary feat considering how perfect she looks from her envy-worthy hair to her expensively painted toes. Fellow commuters couldn't help but do a double-take 'cause your hair is seriously fab. Admit it, you're beyond flattered. 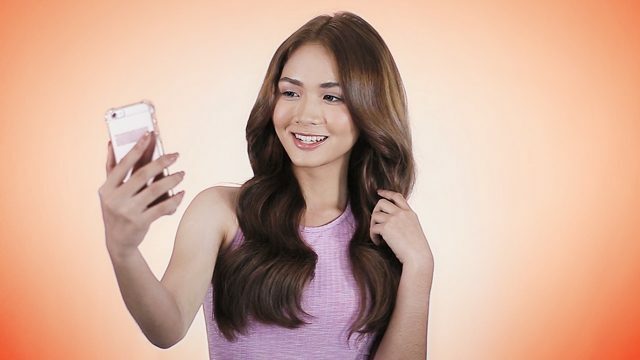 Kulot girls know the ~feels~ all too well: It's rare that you don't need tons of hair mousse, oil, or whatever product to get those dreamy waves. Wondering how to enjoy the #LugayEffect every day like these lovely girls? Try Palmolive Naturals Perfect Ends Shampoo! The secret lies in the specialized formula, which is infused with ceramides and argan oil extracts. It instantly coats the hair from root to tip to strengthen and protect your strands from breakage and split ends when used regularly with Palmolive Naturals Cream Conditioner. With continued use, hair stays beautifully long effortlessly. You'll fall head over heels for the long-lasting and irresistible scent the shampoo gives your locks, too. This article was created by Summit Storylabs in partnership with Palmolive.